A new report published by the Center for Economic and Social Rights (CESR) finds that human rights in Ireland are being undermined by response measures implemented in the wake of the country's financial crisis. 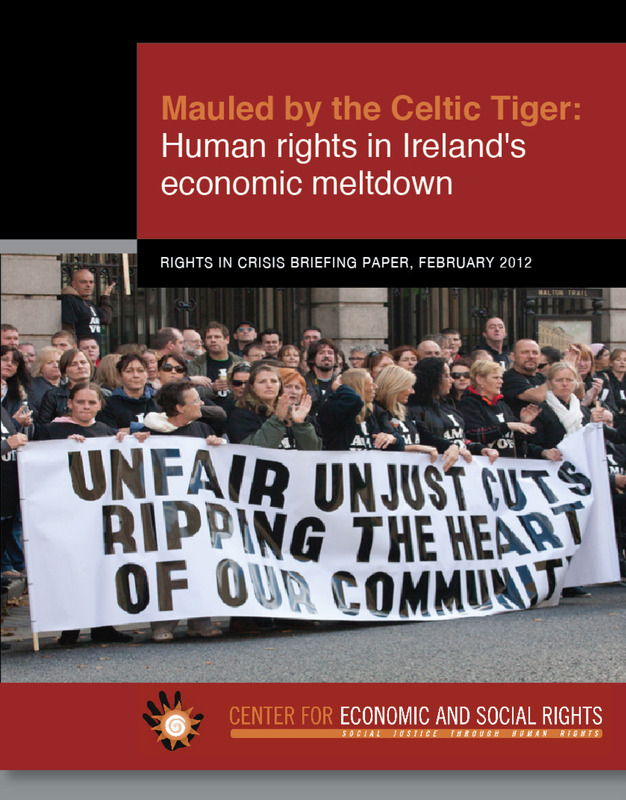 Mauled by the Celtic Tiger: Human rights in Ireland's economic meltdown shows that the country's social and economic policies have not given due regard to its commitments under the International Covenant on Economic, Social and Cultural Rights (ICESCR), which it ratified in 1989. Ireland also seems to have ignored provisions in its own Constitution as it implemented a series of austerity budgets that have markedly undermined several economic and social rights, including the rights to education, health, housing, employment and an adequate standard of living. The recovery strategy prioritizes spending cuts over tax contributions, thus unnecessarily undermining the provision of ESC rights among vulnerable groups. Those responsible for the crisis have meanwhile been left relatively unaffected, thanks in part to the extravagant provision of resources to bailing out the banking sector and a regressive tax regime that is fuelling to rising inequality. Disproportionate funding cuts and "restructuring" of independent human rights bodies have also contributed to setbacks in human rights. Given that this recovery strategy was designed in partnership with EU and IMF, there is also some doubt as to whether Ireland's partner countries have met their extra-territorial human rights obligations. This is true with regard to both the member states of international organizations and those countries that either count themselves among Ireland's creditors or are host to its creditor institutions. These facts notwithstanding, now that retrogression in the provision of ESC rights in clearly evident, the government of Ireland is obliged to take immediate corrective steps to redress this situation. Despite the government's repeated statements to the contrary, there do exist alternatives to the current economic policies which work to deprive the Irish people of their inherent economic and social rights entitlements. The lessons of the current crisis must be learned if Ireland is to prevent further retrogression in the human rights of its population, and achieve a recovery that is both just and sustainable.